“Determined.” That’s how Ruth, an 83-year-old bilateral amputee describes herself and that is certainly how she has led her life. As a bilateral amputee who has lost both of her legs above the knee, she uses a wheelchair to get around most of the time. She also does exercises, “wheelchair push-ups,” throughout the week to strengthen her arms to be able to do small tasks. But, she still practices walking on two full-leg prosthetics at least three times a week. A native Clevelander who grew up in Berea, she has two daughters who live nearby and a son who lives out of town. She didn’t want to rely on their help all the time. “I was tired of bothering the family all the time,” she said. So, remaining at home while also being independent was very important to her. When she was a single-leg amputee, occupational therapists from VNA of Ohio taught her small things like how to dress herself, sweep the floor and turn on the stove. Her physical therapist assistant Mary even helped her learn to walk up and down the stairs so she could do the laundry on her own. Then, only two years after losing her left leg, she lost her right leg too. While many people, especially older people who already experience natural aches and pains, would give up, Ruth again demonstrated her determination by wanting to continue walking. “Ruth is very motivated. She likes to take care of herself. She’s very independent,” Mary said. Ruth has used VNA of Ohio’s services for many years now, working with social workers, skilled nurses, occupational therapists, physical therapists and has VNA’s private-duty care for light cleaning and other household tasks. Learn more about physical therapy at home and occupational therapy at home or call us today at 1-877-698-6264. 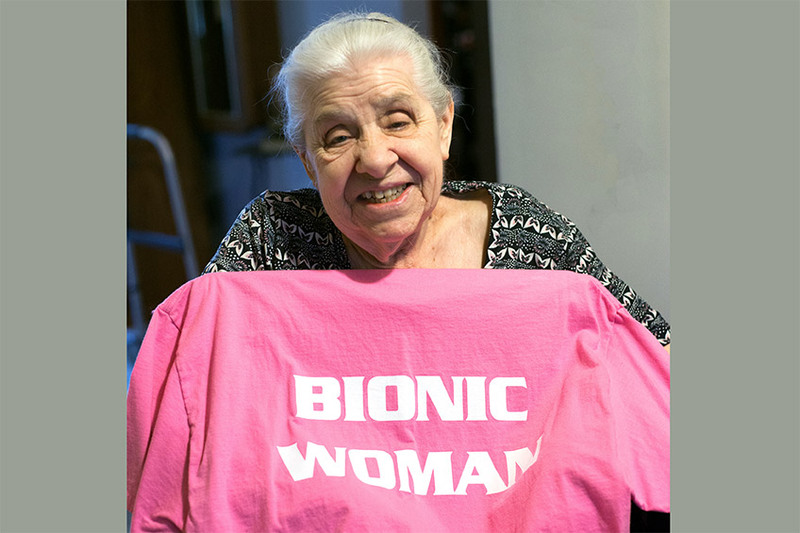 Photo: Ruth with a t-shirt courtesy of Yanke Bionics, the company that also made her prosthetics (photo credit: Thien Nguyen).